Some of the best places to eat are those completely off the beaten path, and Alice’s Kitchen in North Salt Lake is just that. Located in an industrial area, it might be hard to find unless someone guided you there. Once you arrive in the parking lot, you might still feel lost—until you are welcomed inside, and take your first bite. This is homestyle, stick-to-your-ribs kind of food. The clientele is mostly regulars who hear their name shouted when they walk inside. Many of them are looking for the breakfast platters, which are also served during lunch. 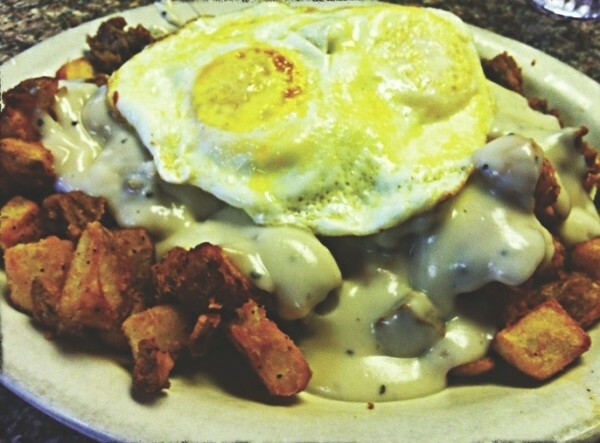 The cross-country platter has two eggs, diced chicken-fried steak, home potatoes and onions, all topped with country gravy, plus your choice of toast, biscuit, English muffin, pancake or scone. Arrive as hungry as you can, and I almost guarantee you still won’t finish the platter, let alone the side. The chicken-fried steak and potatoes are crispy and delicious with their delectable breading. The gravy must have been made by a culinary genius because it’s rich, creamy and perfectly seasoned; it could make your shoe taste good. On this mountain of food, each component battles for which is best. In my book, they all win. Should you order the scone as your side, you’ll find it perfectly crispy on the outside, doughy in the middle and tasting like it was cooked in butter. To top that off, it’s served it with honey butter. It’s worth the price alone to watch that gob of honey butter melt into puddles on top of the scone. The beauty of it all just might make you cry. In addition to the cross-country, there are also other platters, omelets, pancakes, French toast, burgers and sandwiches. The location, atmosphere and especially the food will make Alice’s feel like your own personal diner.